It seems like life these days get busier and busier. For most families, including mine, even a 30 minute meal can be challenge on many evenings. I find that it gets even harder to get a delicious dinner on the table and we end up ordering take out or going out to eat. This leads to spending a lot more money and, frequently, wasted food since I’ve actually bought food to make but just didn’t have time to make it. But, I find when I take some time one day a week to do a little meal prep that all changes. One of the keys to making meal prep actually work is to make sure you have the right tools and recipes. 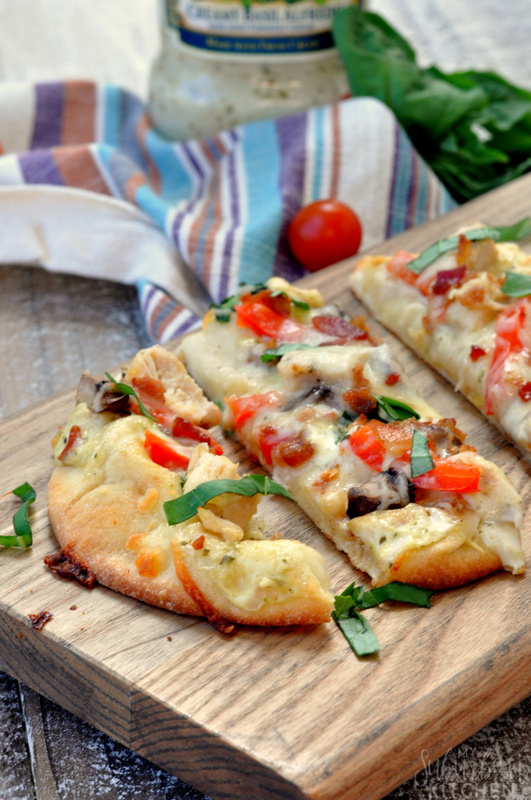 This tomato basil skillet recipe is perfect for transforming the leftovers into a yummy chicken Alfredo flatbread pizza. I just store my leftovers in my new Rubbermaid® Brilliance™ containers that I got from Walmart until I am ready to reinvent them into a new dinner. They also work great for storing the ingredients that I prep for any recipes throughout the week like chopped veggies or prepared sauces. They are 100% leak proof guaranteed and stackable so they can make storage in the refrigerator easy and convenient. Both the tomato basil chicken skillet and chicken Alfredo flatbread pizza come together super fast thanks to Bertolli®’s new Creamy Basil Alfredo sauce. With Tuscan roots, Bertolli® insists on their sauces being made with the highest quality ingredients. 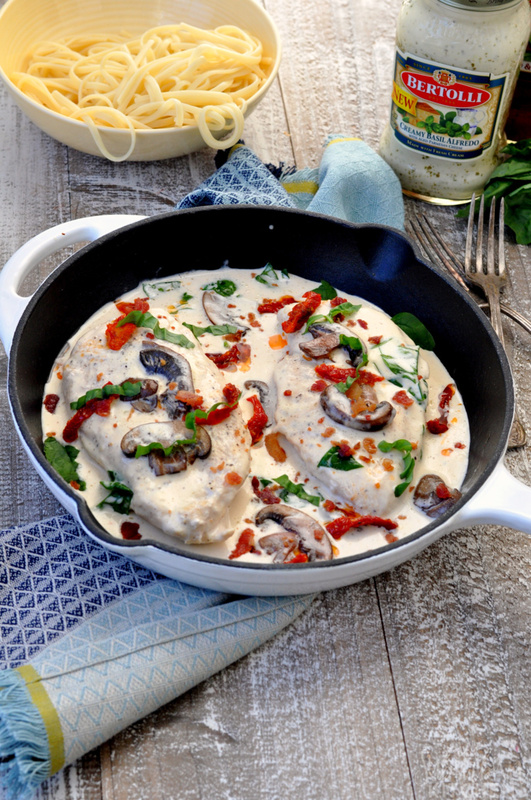 The creamy basil Alfredo sauce so creamy and full of fresh basil flavor. 1. Season chicken breasts on both sides with salt and pepper. In a large skillet, heat oil over medium-high heat. Add chicken breasts and cook for 3-4 minutes on each side. Remove from skillet. 2. Add mushrooms and grape tomatoes to skillet. Cook for 1-2 minutes. Reduce heat to low. Stir in Alfredo sauce and half and half. Add chicken and sun dried tomatoes. Simmer for 5-10 minutes. Top with grated Parmesan and basil just before serving. This recipe is so easy and delicious. I can quickly toss a salad together while the chicken simmers for a meal that is ready in under 20 minutes. 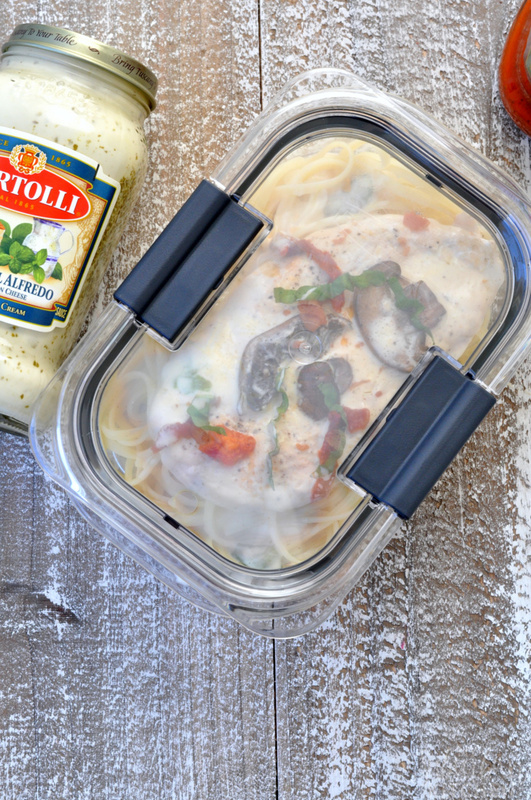 I always transfer two of my chicken breasts and some sauce to my Rubbermaid® Brilliance™ containers and place in the refrigerator to be used for chicken alfredo flatbread pizzas on another night. 1. Preheat oven to 400 degrees. Line a large, rimmed baking sheet with foil. Place flatbread on top. 2. Spread flatbread with sauce. 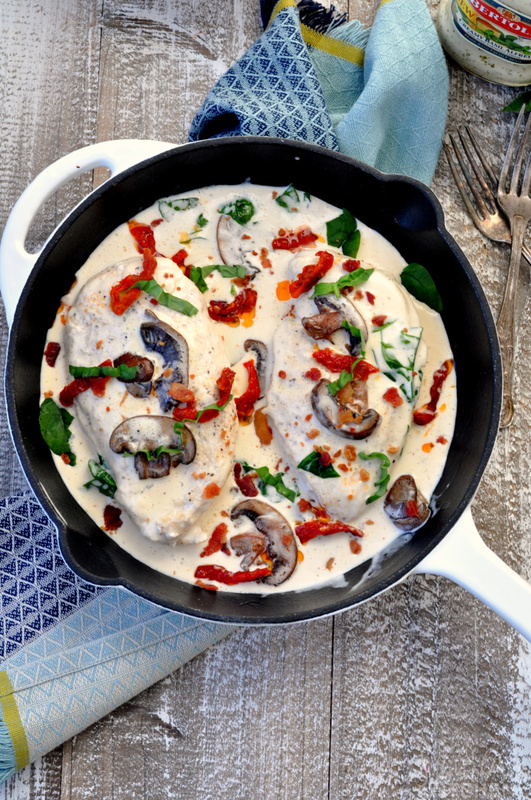 Top with chicken breast pieces, red pepper slices, mushrooms and bacon. Sprinkle with shredded cheese. 3. Bake in preheated oven for 10-15 minutes or until cheese is melted and bubbly. 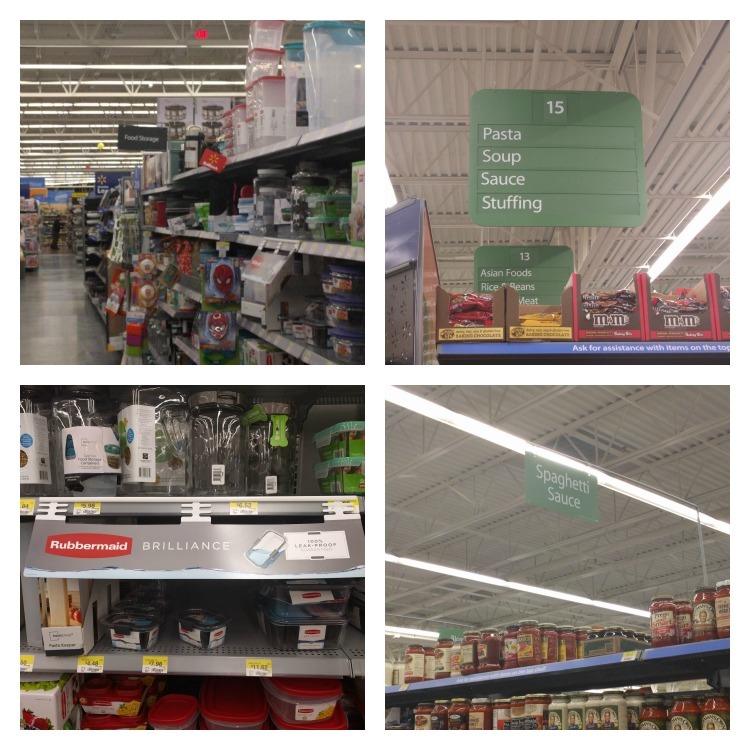 The products are super easy to find in your local Walmart store! 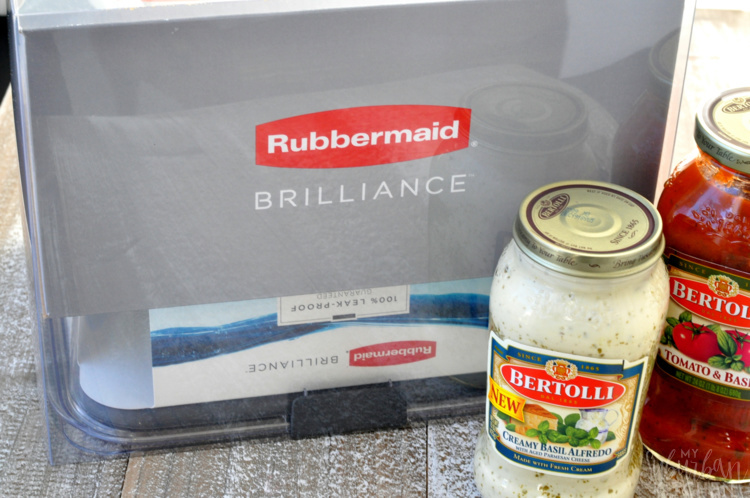 Also be sure to visit here for tons of savvy meal solutions from Bertolli® and Rubbermaid® Brilliance™! Season chicken breasts on both sides with salt and pepper. In a large skillet, heat oil over medium-high heat. Add chicken breasts and cook for 3-4 minutes on each side. Remove from skillet. Add mushrooms and grape tomatoes to skillet. Cook for 1-2 minutes. Reduce heat to low. Stir in Alfredo sauce and half and half. Add chicken and sun dried tomatoes. Simmer for 5-10 minutes. Top with grated Parmesan and basil just before serving. Preheat oven to 400 degrees. Line a large, rimmed baking sheet with foil. Place flatbread on top. Spread flatbread with sauce. 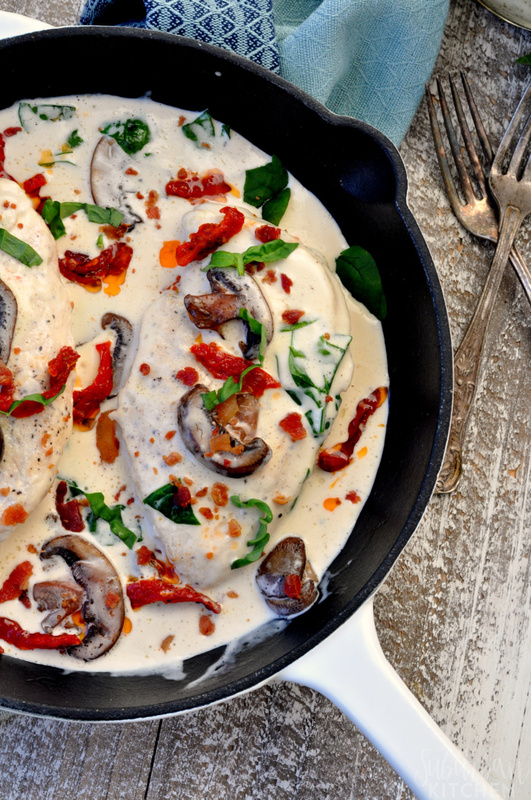 Top with chicken breast pieces, red pepper slices, mushrooms and bacon. Sprinkle with shredded cheese. Bake in preheated oven for 10-15 minutes or until cheese is melted and bubbly. Looking at that I am so ready for fresh basil season again! Yum! Yum yum yum! Thanks for the recipe! Pinned & sharing on Fb~ Thank you for sharing on Merry Monday! Have a great week! Looks yummy and I love the flat bread. Thanks for sharing with us at #OvertheMoon Link Party. I’m pinning and sharing. Shannah, Another fabulous recipe that is sure to become a family favorite! Thanks so much for sharing it with us at Snickerdoodle! Pinned to share. Going on the menu next week! Mmmm! That looks like a delicious family pleaser to me. Having a shortcut on hand is always a good thing! My kids are picky about tomato sauce but they love alfredo sauce. 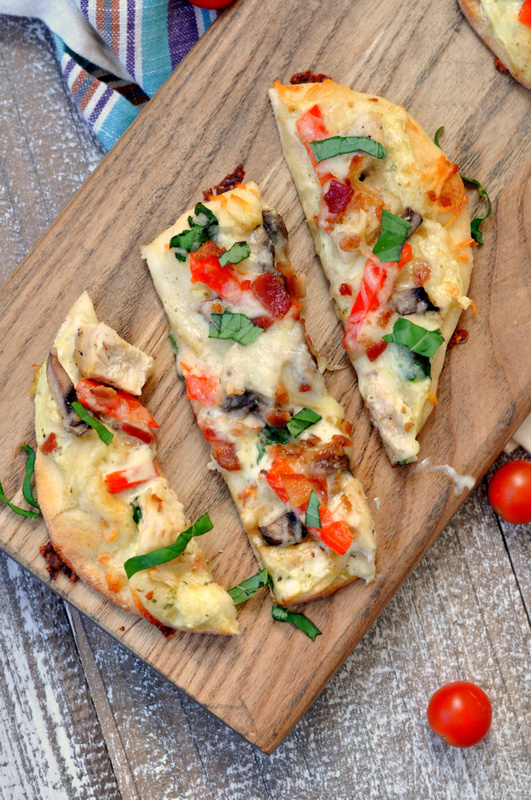 This might be a great alternative to your average pizza that they will love. Thanks for sharing it. This looks yummy! I love how easy it is to make as well. Thank you for sharing at Dishing it and Digging it link party. I just pinned your delicious Tomato Basil Chicken Skillet! Thanks so much for sharing your awesome recipe with us at Full Plate Thursday. Hope you are having a great week and come back to see us real soon!